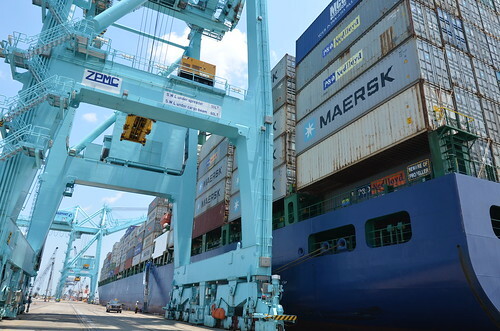 JAXPORT today welcomed the first ship in Maersk Line’s new weekly service through JAXPORT’s Blount Island Marine Terminal. The addition of Maersk Line, the world’s No. 1 container shipping company, means nine of the world’s top 10 global container carriers now offer their customers the efficiencies and cost-effectiveness of moving goods into and out of Northeast Florida. Maersk Line’s TP10 is a new service between the U.S. East Coast and Northern China and South Korea. It offers direct service from Jacksonville to Xingang, Qingdao and Shanghai in China and Busan in South Korea. SSA Marine provides stevedoring services at Blount Island. Jacksonville is the No. 1 container port complex in Florida.